Here on the Frump Fighters blog (written specifically for moms!) we make it our goal to help you wade through the fashion world and easily find the bright, exciting new things that can help you step up your wardrobe. Can you believe we're heading into another new season? Cooler temps outside and warmer temps inside, boots and sweaters, lattes and warm apple pie. I'd happily add to that a book or movie and a big fuzzy blanket too, but hey, I don't want to be greedy. Fall and winter can be an easy time to just throw on a bunch of layers and call it good. But proportions, styles, and even trends can make or break an outfit. Figuring out what's in style each season can be time consuming. It's easy to grab something off the rack at Target while speed walking through on a diaper run. But try not to cave to the pressure! Using our list of mom-friendly trends for each season you can afford to take the extra two minutes to find exactly what you need (or decide to avoid) in a grab-and-go trip. These 11 current trends made the cut, and there are others that we chose NOT to include either because they were 1) expensive, 2) not modest/classy, 3) not conducive to mom life! So, ladies, here's our Fall/Winter 2018/19 edition of "Fashion Trends That Are Mom Friendly." 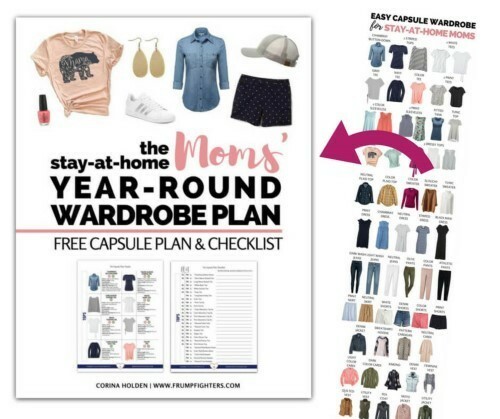 Download our free eBook of Mom Wardrobe Basics that cover the whole year! It seems like you either love this one, or hate it. Last year we saw a lot of leopard print, but this year it's not just leopard, but all types of animal print, from zebra to snakeskin. In a small scale, animal print can be a great way to add some interest to basic, classy styles. My leopard print flats and scarf are two of my favorite wardrobe pieces! The updated Year-Round Wardrobe Plan uses a dark printed scarf as one of the accessories and leopard is a great option! Need to add some sunshine to your outfits? This trend has you set! Yellows from dark mustard to bright lemon are very popular this season and an easy way to brighten up the darker fall colors. If you don't want to commit to a full dress or pants in one of these hues, a belt or shoes is a great way to add just a little pop of color! Mustard is one of the accent colors we used in our example color palette in the new Year-Round Wardrobe Plan. 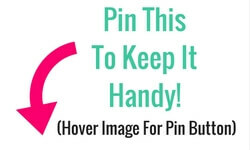 Go grab the freebie and see what items we've used in this color! In this trend, a little goes a long way. The nice thing about metallics though, is that from bronze to silver they are all neutrals! I definitely have my eye on some slides or drop earrings! Two of the shoes and one of the earrings in this collage are used as example pieces in the updated Year-Round Wardrobe Plan. These pieces are so versatile, when matched with the right wardrobe you'll find you wear them a lot! Buttons are not just for tailored blouses this season. Pants, dresses, skirts and tops are all sporting buttons. This trend is so great for basic pieces (like jeans!) because it's something you'll wear regularly, so more worth the money, and can be incorporated with tons of other looks. Hello, versaility! This is also a great trend for any nursing mamas! Ties on pants, ties on skirts, ties on sweaters, blouses, tees, shoes and more! Basically one of the easiest trends to add this year they are on every type of clothing piece out there! Go grab a basic tee with a tie on the front or some high waisted slacks with a large tie at the waist to instantly add some interest to your outfit. Four of the pieces in our example collage above are from the new Stay-at-Home Mom's Year-Round Wardrobe Plan! Go grab the freebie while you are here! Admittedly, I'm not sure what to think of this one, but it's out there and it can totally be mom-friendly so I'm including it. ;) Think logos, baseball tees, stripes on sleeves or down pant legs, uniform-like outfits, letterman jackets, and oversize blazers. This is a type of menswear styling which was trending a bit last fall and we are seeing more of it now. With the right pieces you can totally pull off this trend and knock casual-chic, on-the-go mom looks out of the park. You don't have to be a country girl to pull this one off! From denim everything (tops, dresses, jumpsuits and more) to peasant blouses, sherpa lined jackets and suede shoes, western styles are definitely in and you don't have to channel Little House on the Prairie to pull it off. ;) I love the subtle details like thick stitching on seams, pretty trim on tops, and embroidery on sleeves or pockets. You can't go wrong with florals any more. True to the season, a lot of what we are seeing right now are darker colors, but just about anything works. Florals with stripes or polka dots, florals with bright pops of color or monotone florals. Every girl needs a floral top for their wardrobe, but if you aren't convinced a scarf or top with floral sleeves is a great way to ease into it! Florals are feminine and classy and you'll find several floral options in our updated Year Round Wardrobe. If you grab the outfit guide you'll have lots of inspiration on how to wear them! Polka dots are a pretty classic pattern and they are especially popular right now. This can be a very subtle print that pattern mixes very well (like, say, with a larger scale floral or stripe). They are also found on a broad range of styles from delicate, dressy blouses to casual pullovers. Polka dots are my pattern of choice (along with leopard, of course) and I'm so excited Corina incorporated a few polka dot pieces in the new Stay-at-Home-Mom's Wardrobe Guide! I'm always up for a good polka dot outfit. Plaids are nothing new. We've been seeing a lot of buffalo plaid and gingham the last year or so, but this fall be prepared for all kinds of plaid. Pretty much any plaid goes! Tartans, glen plaid, window pane, and hounds tooth and are all prints I've seen when browsing around. Corina has a couple plaid pieces in updated Year-Round Wardrobe Guide. I especially love the inspiration on all the different ways to wear my button-ups! That rounds up our mom-friendly trend picks for fall and winter 2018/19. You can be confident that when you incorporate some of these looks into your fall/winter wardrobe, you will be looking relevant, stylish, and super cute! Did you find this post helpful? What is your favorite trend? Do you want a wardrobe that works for you? A wardrobe with all the footwork already done? 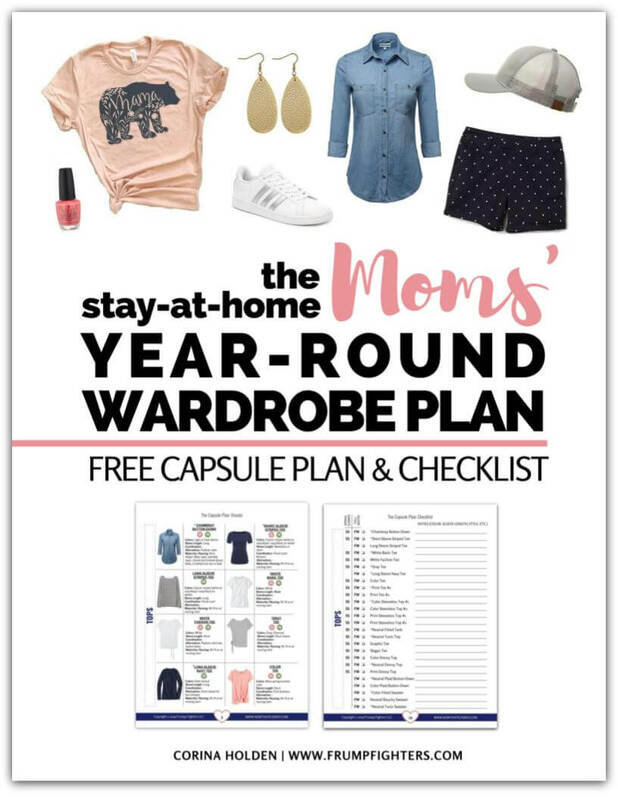 Grab the freebie of our NEW Year-Round Wardrobe Plan below!